The director and screenwriter was Mark Parks, who had previously helped produce feature films Biff Wellington and The Stars Look Tired. He also co-produced a Bell Fibe TV1 series called The Underdog. Mark sat down to chat with us about Dead Air and the path that lead him to create it. THGM: Where did you come from? Are you an Ottawa native? Mark Parks: I was born in 1980 in Kingston. I moved around a lot as a child, but settled down in Perth, then Ottawa as an adult. So it’s been pretty much eastern Ontario all my life. THGM: A lot of people want to know what it takes to be a writer. Did you focus on that in school? Mark Parks: Not really. I had a regular high school education. THGM: So no PhD…how did you become a writer? Mark Parks: I began writing in Perth, mostly at work because that’s where I spent 16 hours of my day, behind a gas station cash register. The good thing about that job was the time it gave me to be by myself and to daydream. And of course, write. THGM: So your advice to would-be writers would be to get a real job? Mark Parks: Ha ha, well not necessarily, but it did work for me. I fell upon writing after years of not knowing what the heck else to do. I did not pursue a post secondary education, not because I wasn’t smart enough, but because nothing appealed to me. Accounting, I could do, sure. But, would it appeal to me year after year? Same went for most professions. Everything seemed mundane and repetitive. No flavour. I would not pay a small fortune to learn how to do something I would grow to hate. THGM: So what made you choose writing as that profession you wouldn’t grow to hate? I suppose the seed of writing grew in me over time. Maybe I swallowed a melon seed while watching As Good As It Gets, or Devil’s Advocate, or The Godfather. I think that what drew me towards story telling, in general, was how these stories could pull you into a world not your own and elicit emotions and thoughts from you. I mean, in a way where these thoughts of fiction become real to you until that last page is turned or until those credits roll. And there you are, left staring at the screen, just thinking about what you’ve just experienced. I wanted to give that to people. Whether it be poetry, in a novel, or on the screen…at some point in my life, and I’m not really sure when, I knew this is what I wanted to do. THGM: You write poetry, too? Mark Parks: Yes, I even won a cash prize for poetry once. THGM: Mark Parks, award winning poet! 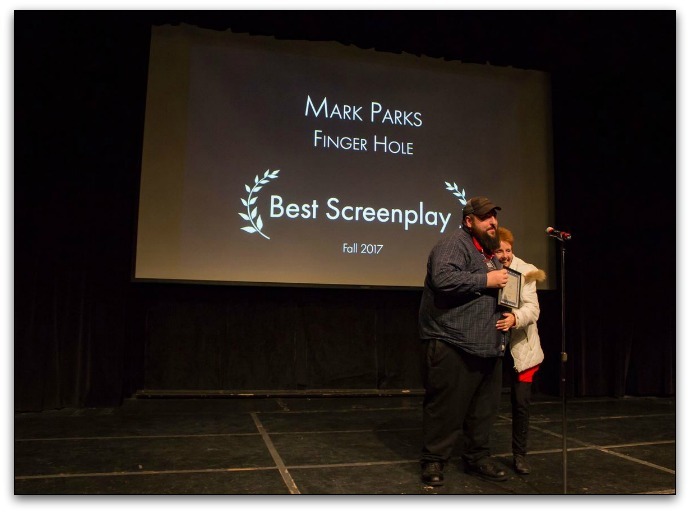 Mark Parks: Yes, technically, but I won two screenwriting awards with Digi60, so if we want to count awards, you’d best call me a screenwriter. THGM: Fair enough. So how did you become a screenwriter? Not every writer writes screenplays. Mark Parks: I actually started my foray into writing with books. I failed at this. Writing a book is much more tedious and you require so much attention to detail to pull off a good story. Internal monologue, building a world in believable and vivid detail, and so much more that, as I came to realize, was not required in a screenplay. THGM: So you owe your success as a screenwriter to your failure as a novelist. Failure is a better teacher than success, I guess. Mark Parks: Right. I discovered that a screenplay requires only what you see and hear. Yes, there are multiple plot lines, subtext, and details that carry over from the way a book is written. All this means that someone who is less patient than a novel writer must be, can still write a story that appeals to a wide audience, simply by focusing on what details are vital to the story being told by someone else. It’s like paint by numbers. A screenwriter will create the numbered sheet. The producers and directors and all those who fall under those umbrellas will ply their crafts towards filling in those spaces which you left empty for them. 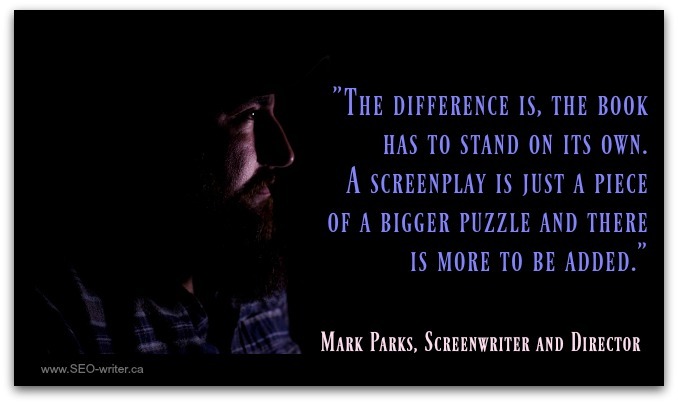 Mark Parks says it’s easier to write a screenplay than a novel. THGM: Very few screenwriters I know take the foray into directing. But you did. Why? Mark Parks: After about a year, maybe two, of taking up writing, I started to feel the need to connect with others. I looked for a co writer without much luck. A few nibbles, but the compatibility wasn’t there. So, I went to a meet and greet in Ottawa and met some film folk who I hoped would shoot one of my short films. I met Vincent Valentino and he had a suggestion for me that matched his own ethos. If you want something done, do it yourself. So, I bought some film gear and eventually moved to Ottawa. THGM: So you moved to Ottawa to launch a career in film? Not Hollywood? Not even Toronto. Ottawa. I just want to hear that again, so that all our readers understand that Ottawa is a happening film destination. Mark Parks: It is! And so at first I’d live in Ottawa weekdays, working on films during that time, and on weekends I’d greyhound back to Perth and work morning to night, before getting back on the Greyhound on Monday again. THGM: You had to pay the bills. Like all those would-be starlets that stereotypically flock to Hollywood and end up waitressing in diners? Mark Parks: I think my trip was shorter. But still, the commute was a strain. This dual residency lasted a couple years before I finally settled down in Orleans. THGM: So what’s it like to be both the writer and the director?. Mark Parks: Working as a filmmaker has both added and subtracted from my role as a screenwriter. It has held me back as a screenwriter, in that it has distracted me from a more dedicated path towards more commercial success. At the same time, writing for my own and other people’s short films for festivals has slowed me to see, with quick result, how my writing translates to screen. This is super valuable and should not be overlooked. For example, I have found out, much to my chagrin, that I am pretty damned good at the more romantic or sentimental films, but my horror films often leave the audience confused as to what’s happening. Perhaps, this is because of how I filmed and edited it, but it is definitely partly due to my writing. Seeing this, I make adjustments and get a bit better each time. THGM: I can’t help but notice that my daughter played a very sentimental role in your horror film. Is this what you are talking about? Mark Parks: It would seem so. For this film, I wanted the protagonist to be a girl with similar problems to some other girls. She is missing her mom who is no longer around. She has to shape her actions around the actions/reactions of an abusive father. She has feelings of isolation and abandonment. The feelings she has are ones anyone can relate to on some level. And, on the other side of the conversation, you have the mother who has guilt for not doing enough to protect her when she was around and shame for being afraid. You see, even in death, she was afraid of her husband and tried to have her daughter just try and cope with him to avoid triggering him. When her daughter said she might run away, it was the breaking point. Being a horror film, I did have to put in a supernatural twist at the end, but for the most part, this was more of a telling of an all-too-common tale. THGM: So talk to me about Dead Air. Where did the idea come from? 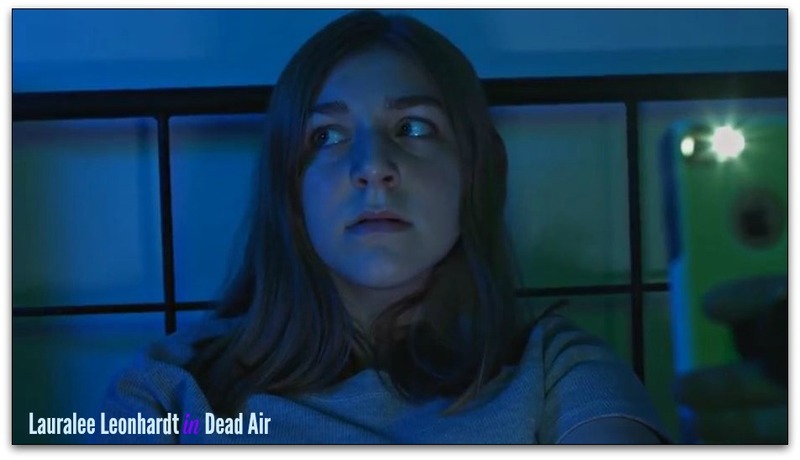 Mark Parks: Dead Air is about a girl who is talking with her dead mother about her fears of being left alone with her abusive father (and murderer of her mother). The Monster Pool theme was technology this time around. I’m not a fan of killer robots, so I simply made the phone she held in her hand a point of focus of the father who did not like her to have an outside line to the world that he could not completely control. The idea was that the audience felt that she was talking to her mother on the phone, only to realize she was using it as a light to shine on her mother who sat, dead with hammer in her head, on the end of the bed. I’m not sure how well we pulled that off in production, but it was a fun try at it. THGM: Did you find it challenging to write Dead Air? Mark Parks: I usually do not have challenges with writing short films…I think the biggest one was just finding an idea I liked. This one came to me out of another conversation, but it did take a few weeks to come up with. Once I did, I wrote it in about an hour and a half. Also, horror is not really in my wheelhouse…not traditional horror. I would lean more towards psychological horror having to do with the bad things people are capable of doing. Silence of the Lambs type of stories, I suppose. THGM: So this was a lean production. Can you tell our readers about that? Mark Parks: The entire film lasts 4:40. There were three actors and one camera person. There was one camera used. Well, two. One was used only for the final attack scene—the Canon 5D mk ii—and the rest was shot with a Black Magic Ursa. It was edited on Adobe Premiere. Screenwriter Mark Parks says that directing has opened his eyes to how his words translate to the screen. THGM: Dead Air was part of the annual Monster Pool anthology—a film in its own right, but also a film within a film. Did that affect the script, the filming or the production? Mark Parks: Being a part of the rest was not much of an issue. We had autonomy in what we wrote, so long as we went along with the assigned technological theme. Ours was “the telephone”. We made the phone the focus of the antagonist, not the actual catalyst of the crisis or the protagonist itself. The producers of Monster Pool created a wraparound and connecting pieces to introduce and tie together all of the films in an entertaining way. THGM: Any regrets? Anything you would do differently with Dead Air if you were to start over? Mark Parks: I would probably have the lighting starker. On the side of the door, where the hammer is embedded in the head, I would go darker on that side and make the light brighter on the mother’s right side which faces the daughter. It kind of visually draws the line between life and death. Also, the light on the mother would have made it look more like she were in a different location more effectively. THGM: What’s next for Mark Parks? Mark Parks: I’m working on another entry for DIGI60 Filmmakers Festival. This is around my eighth time doing this event. A seven-minute film based upon their topic of “change”. My film is about a young man coping with a job change, but finding time to help someone else make an important life change, only to find out this person is more than who he originally thought. I am also a writer for someone else’s DIGI60 project. This one is about a business woman who decides to help a homeless woman by cutting a large cheque, much to her friend’s objections, as tribute to an indelible memory of her childhood. I’m also writing a feature film which I hope to produce in the fall. This is the first feature of my own that I would produce. THGM: The other two you co-produced, right? Mark Parks: Yes. 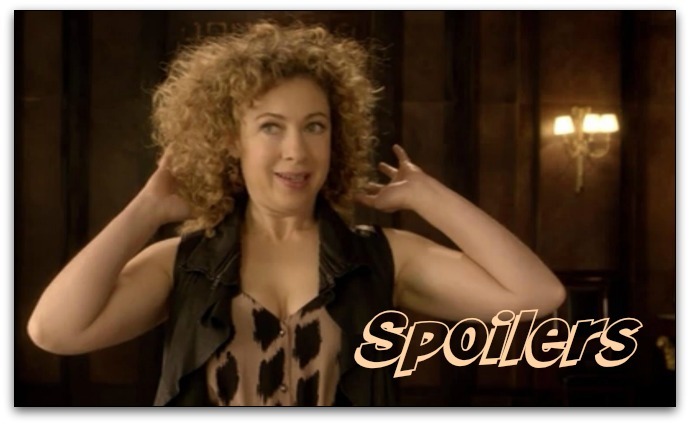 Let’s just say that the characters and their relationship develop in surprising ways. It’s a story of healing. It’s a story of discovery. It’s perhaps a coming of age film, in a way. THGM: And beyond the current projects, what does your future hold? Mark Parks: Future me? I see myself writing more than filmmaking. But I do see having a producer’s hand in some bigger projects, if funding goes well. THGM: Any advice for young writers? Mark Parks: Just keep writing. Write about what interests you personally. It will come across as a lot more genuine. Listen to criticism. Pats on the back are great, but I find those pats drive you more into the ground, your feet getting stuck in the ways you always do things. You never change or grow with a pat on the back. You will know when you deserve the pat on the back. Look for someone to pick apart your story. Answer their questions. This will make you think from another point of view and will help you grow. You may not take the advice every time, but sometimes you will, and this will lift you up. 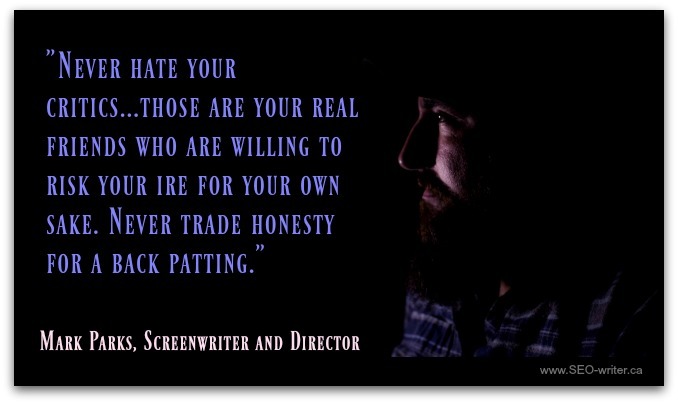 Never hate your critics…those are your real friends who are willing to risk your ire for your own sake. Never trade honesty for a back patting. THGM: Thanks for taking the time to chat with us, Mark. I wish you success in all your upcoming projects, and I hope to see your name in many credits to come.